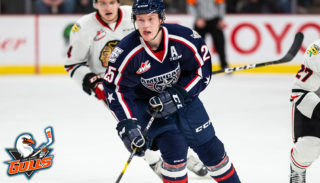 With the NHL Draft right around the corner, we wanted to take some time and profile each American that was named on the final rankings put out by NHL Central Scouting for North American skaters. To start things off, we are profiling Dakota Krebs. Dakota flew under the radar this season. 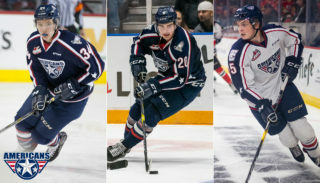 With a star studded Defensive unit including Juuso Välimäki and Parker Wotherspoon, Dakota spent most of the season on a grinder third line unit. He thrived in that position, playing 70 out of the Americans’ 72 regular season games. We asked him a few questions to find out what he thought about his season and what it’s like to be ranked. How did you feel about your play this last season? This season I was put in a position where I was a regular in the line up and I was able to contribute to help the team win. Being in this position I believe I learned a lot on how to play with confidence and I gained a lot of experience playing in this role. This season was a major stepping stone in becoming the player I am working to become. What are your goals for this next season, for you personally, and for the team overall? 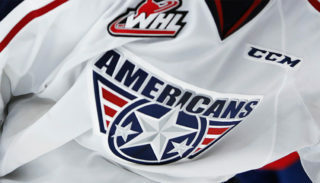 This coming season I am striving to be a top defenceman on the Americans. Being a shut down force on the back end is something I take pride in and in this upcoming season I would like to be the guy the team looks to shut down top lines. Looking into every season, the goal is to win a championship. I believe with the deep group that we have, working towards a WHL and Memorial Cup Championship is definitely in our sights. 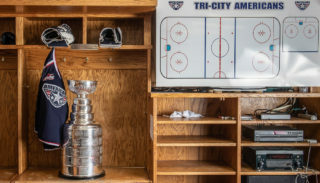 What are you doing this off season to not only get ready for August (our camp and possibly NHL camp), but also what are you doing to stay focused on your goals? The off season is huge for helping your body repair and grow for the next season. Right now, I am doing on-ice skill work, power skating, and off ice training. I am currently training with the Athlete Factory of Calgary to help with building my body to be a top player in the Western Hockey League. I am able to train along-side professional athletes of numerous sports which is beneficial for me in becoming the athlete I am working towards being. Every kid who grew up playing hockey dreamed of hearing their name called at the Draft. What are you feeling now that the dream is so close to possibly coming true? It is pretty surreal seeing that I could possibly go in the upcoming draft, it would be pretty huge accomplishment to get picked. Ultimately though, drafted or not drafted, I know that the hard work that has taken me to this point will continue and elevate to a whole new level to reach the National Hockey League. On draft day I will be at home watching the draft with family. I am pumped to see a couple of my close teammates possibly go high in the upcoming draft. Hearing my name being called at the draft would be a tremendous honour, but seeing my buddies that I have played with for the past two years getting picked is also very exciting.